When I first became vegan back in my rather isolated home town in New Zealand, even if I had wanted to use vegan friendly toiletries I wouldn’t have been able to find them. My mother was willing to put up with me not eating dairy but actually smelling like a cow would have been a different story. Since moving over to Ireland however, I have stumbled across a whole host of different vegan products and after much deliberation in my bathroom come testing lab one brand has definitely come out a winner, Faith In Nature. I simply love the stuff! Quite picky when it comes to fragrances, I am hooked on their Chocolate Shampoo and Conditioner, which not only makes me smell like a cake but leaves my hair feeling fantastic. Their Aloe Vera and Tea Tree Hand Wash is also a favourite - there is just something about eucalyptus that I find irresistible, like petrol and maker pens, but good for you! Also a constant in our bathroom repertoire is their Aloe Vera and Ylang Ylang Shower Gel and Foam Bath, which smells just divine (and is rather amusing for our childish selves to try and pronounce, ylaaang yllaaaannnggg). They make it in chocolate as well, which at the shop I always go to reach for first and then think better of it – probably best not to smell that much like a cake, however much I want to. All of their products are paraben free – something I didn’t even know existed until recently but that may be linked to cancer. While there is no hard evidence that this is the case, I’d say there is no harm in keeping dodgy chemicals away from you if you can. 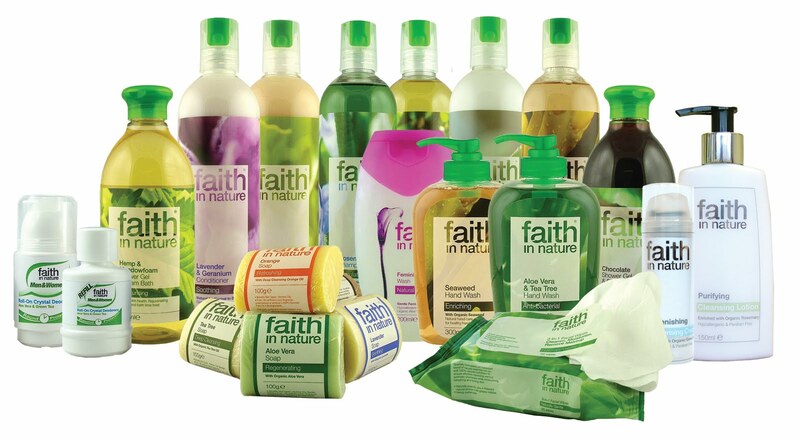 And last but not least, the final reason our place is littered with Faith in Nature's fabulous products is the price – extremely reasonable, smelling so good without covering yourself in animal by-products and chemicals has been made quite affordable. So I entreat you to go, buy, lather (and try not to eat) these wonderful products, because, quite simply, you just 'gotta have faith faith faith' (I know, I'm sorry).